Today begins the highly anticipated (by my mother anyway) run of the all-new Journalistopia cartoon! In this blog about all things online journalism, I’ve written about the latest tips and trends for editors, writers, designers, photographers and more. But, yes it’s true. Between creating Important Commentary and producing Serious Journalism, I was secretly doodling toons all along. With the masses watching lonelygirl15 instead of the evening news and circulation taking a nosedive, perhaps us journos could use a few chuckles. The Journalistopia cartoon won’t be published on any particular schedule, but I hope to put one out at least bi-weekly. The usual commentary will continue to appear on Journalistopia. Feel free to share and post the cartoons on your own blogs, just be sure to attribute with a link back to Journalistopia.com. The Journalistopia cartoon is dedicated to the memory of my late grandfather, Francisco Asencio, a man of limitless creativity who lived to share music, art and humor with the world. 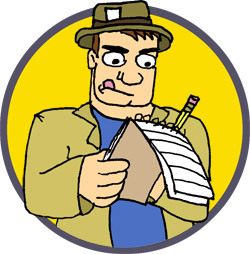 5 Responses to "Introducing the Journalistopia cartoon"
Hope the cartoon will appear in the RSS feed, or I won’t see it. Should be worth a chuckle, though. Keep up the good work! Danny, I just loved your cartoons. I will use this one in our blog. Congrats!